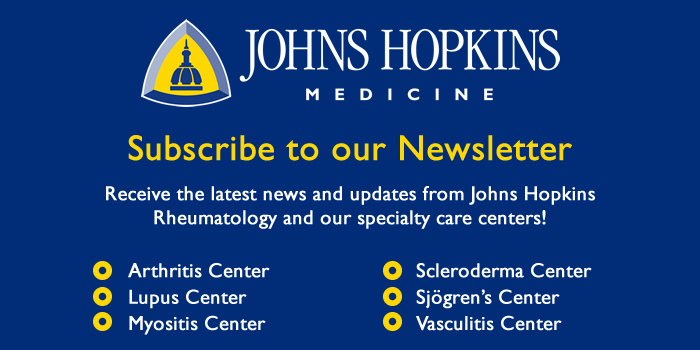 Joint pain is one of the most common symptoms of Sjögren’s syndrome (SS). Multiple joints are painful, usually episodically with periods of joint pain, known as “flares”, followed by periods of little or no joint pain. Tenderness and swelling of the joints, when present, are indicative of an inflammatory arthritis. In Sjögren’s, this type of arthritis usually affects the fingers, wrists and ankles. The shoulders, hips and knees may also be painful. Some patients with SS may have joint paint as a result of fibromyalgia. In general, the pain of fibromyalgia arises from the muscles although it may be perceived as coming from the joints. Fibromyalgia and joint pain related to SS may be hard to differentiate. Fibromyalgia pain is present on a nearly daily basis, with flares of increased pain triggered by exertion, lack of sleep and stress. Many treatment modalities are available to treat joint pain associated with SS. If the joint pain is mild and intermittent, acetaminophen or short courses of non-steroidal anti-inflammatory drugs (NSAIDs) available without prescription may suffice. If the joint pain is more persistent, prolonged use of prescription-strength NSAIDs may be required. Chronic therapy with prescription-strength NSAIDs has a risk of inciting potentially dangerous stomach ulcers in up to 4% of patients each year, particularly in elderly individuals as well as those who are taking blood thinners or corticosteroids or have had a prior history of stomach or peptic ulcers. Steps can be taken to reduce this risk. These include using the lowest dose that controls the joint pain, taking the NSAID with food, choosing an NSAID with a lower risk of gastrointestinal side effects, ant taking a proton-pump inhibitor, such as omeprazole or pantoprazole, along with the NSAID on a daily basis. Hydroxychloroquine (Plaquenil) is commonly used for treating joint pain in SS patients, based in part on its efficacy in treating the joint pain of patients with systemic lupus erythematosus and rheumatoid arthritis. It is generally well-tolerated but its use for a period of 10 years or more is associated with potential damage to the retina of the eye in 1 out of 1000 patients. Patients taking Hydroxychloroquine for prolonged periods should thus have yearly eye examinations. More severe forms of arthritis associated with SS may require treatment with disease-modifying anti-rheumatic drugs other than Hydroxychloroquine. These include methotrexate, leflunomide, cyclosporine, TNF antagonists (such as etanercept, adalimumab and infliximab), and rituximab. Prednisone can be a very effective and quick-acting treatment for arthritis, but chronic therapy, even in low doses, leads to an increased risk of osteoporosis. Higher doses should only be used for short periods of time, since these can result in so-called Cushingoid side effects, such as weight gain, diabetes, bruising and increased risk of infection. Non-pharmacologic measures are also important aspects of the therapeutic program. The application of moist heat to the hands with a paraffin bath can help relieve stiffness of the fingers and wrists in the morning. Gentle exercise, including Tai Chi, yoga and dancing, can serve to strengthen muscles and preserve joint range of motion. Nutritional supplements, such as glucosamine or fish oils, may also help some patients. Finally, experimenting with one’s diet may reveal certain foods that aggravate the joint pain. This is variable, but elimination of dairy, bread products, or excessive salt can reduce joint pain in some individuals.